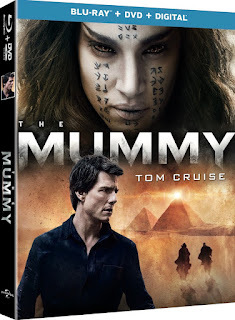 Cody takes a look at the Blu-ray / DVD release of The Mummy. The Mummy was my most highly anticipated horror release of 2017, as if offered the chance to watch one of my favorite actors, Tom Cruise, make a rare appearance in the genre to face off with a new iteration of one of cinema's greatest monster icons. Not only that, but this film promised to lead to something more, something bigger. The better part of a century has passed since the original Universal monsters stalked across the big screen and then shared the screen in crossovers, and now Universal is building the Dark Universe - a series of connected films that will bring the monsters back in modern times. Starting with The Mummy. I saw the movie when it was released back in June and enjoyed it (you can read my initial reaction in this article). It's a fun monster movie with adventure, spectacle, humor, and plenty of creatures going around for Cruise and his co-stars to fight their way through. I also enjoyed seeing Cruise play a character who's a bit different from his usual heroic role; Nick Morton is a comedically flawed person who is only out for himself. The only issue that caused the film to feel a little underwhelming to me at the time was that it seemed to become too preoccupied with world building in the second half. The first 40 minutes of The Mummy are great. I love the introduction to this world - the discovery of ancient tombs beneath London during an expansion of the underground, Nick Morton seeking treasure in Iraq and discovering the tomb of forgotten Egyptian Princess Ahmanet (Sofia Boutella), who was condemned for murdering her family and making a deal with a demon while on a quest for power. 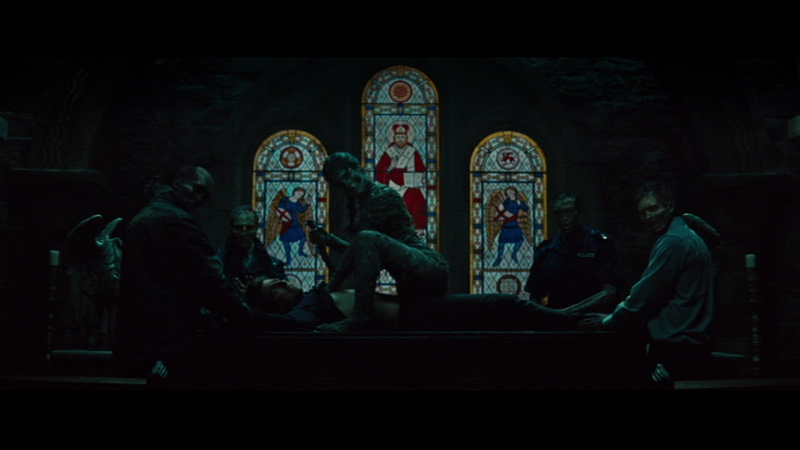 Ahmanet's sarcophagus is loaded on a plane that ends up being crashed in England by supernatural forces. Nick is killed in that crash, but comes back to life because Ahmanet has chosen him to be the human vessel for the demon she made her deal with. Just as Ahmanet rises from the wreckage of the plane to pursue Nick, however, things start to feel a little awkward. I wasn't the fan of the comic relief addition of the spirit of Nick's dead sidekick Chris Vail (Jake Johnson) appearing to him in a bit straight out of An American Werewolf in London. An action moment involving a sandstorm seemed like an afterthought. And even though I'm all for the building of the Dark Universe, which will be held together by the presence of a monster-hunting organization called Prodigium - which has its headquarters in London's Natural History Museum and is led by Russell Crowe as Dr. Henry Jekyll - there is a stopover in Prodigium HQ that feels too long. 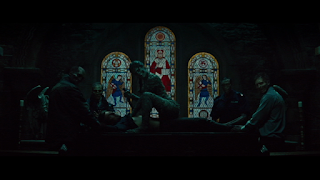 There may only be 20 minutes set in the Prodigium base, and there's a scene where Jekyll transforms into his sinister alter ego Mr. Eddie Hyde to keep our attention, but that's still 20 minutes of hanging out in one location and talking while Ahmanet is held captive in chains. That's one fifth of the overall running time (not counting end credits). The Mummy has missteps and some elements I'm not so enthusiastic about, but in the end I find it to be a solid, entertaining monster movie. I'll be giving it further viewings and look forward to spending more time in the Dark Universe. I really want to see this series succeed and get even better. After making more than $400 million at the global box office, The Mummy is now coming to home video on 4K Ultra HD, Blu-ray, DVD, and digital. The Blu-ray and DVD are pretty well packed with special features - in addition to an audio commentary with director/producer/co-writer Alex Kurtzman and some of the cast members, there are almost 80 minutes of behind-the-scenes featurettes and other extras. 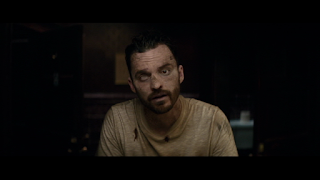 I started going through the extras by listening to the commentary, where Kurtzman is joined by Sofia Boutella, Jake Johnson, and Annabelle Wallis, who plays archaeologist Jenny Halsey. It's a decent track that was recorded before the film was released, and in fact even before the Dark Universe logo was unveiled online. This was the cast's first time watching the movie, and they had to do so while talking instead of listening to the sound. An interesting situation. From this commentary I learned that the discovery of the tombs beneath London was actually inspired by a real incident, and the news footage covering the discovery in the film was real news footage. 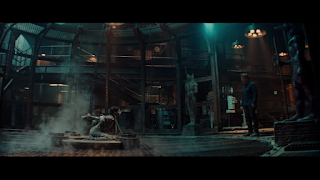 While the conversation includes discussing what it was like to film certain scenes, particularly stunts and effects, this commentary also reveals that there was a thread involving Jenny's mother that was entirely removed from the film, and putting the gist of the Mummy's back story up front was the result of a structure change in the editing room. It was a good choice, I think. It works better to know who Ahmanet was before her tomb is found by Nick. Some fun trivia: the cast and crew would watch movies to prepare for the making of The Mummy, and films screened included The Birds, Vertigo, and The Shining. A pub in the movie was also featured in The Conjuring 2. Kurtzman points out the Easter egg of the Book of the Dead from the Brendan Fraser version of The Mummy being in Prodigium HQ. He also mentions that he wanted the film to be a collision between horror and comedy, along the lines of An American Werewolf in London (that influence is made obvious with the Vail character) and the Evil Dead franchise. A lot of the film's attempts at humor work quite well for me, and they work better the more I watch it. Next up was a featurette called Cruise & Kurtzman: A Conversation, which was exactly what the title says. Cruise and Kurtzman sat down for a 21 minute conversation that basically serves to make up for Cruise's absence on the commentary track. They have a good time discussing various elements of the film and the experience of working on it. There are just under 5 minutes of Deleted and Extended Scenes to look through. There's more of Ahmanet's back story, an extra scene with a morgue doctor, an extra Vail moment, and a quick beat where Jekyll confides in an employee that he can no longer control his Hyde personality. Aside from maybe the Hyde line, the movie isn't missing anything without these moments. The Rooted in Reality featurette runs approximately 7 minutes and delves into the idea that the filmmakers want the Dark Universe movies to be set in our contemporary real world, with the monsters surfacing in our reality. The creatures are otherworldly, fantastical, and creepy, and they are living among us. For 7 and a half minutes, the Life in Zero-G: Creating the Plane Crash featurette shows us how the plane crash sequence was shot. Filming took place on a real plane achieving zero-g 25,000 feet in the air. The cast and crew went into zero-g 64 times, and each time would have somewhere in the range of 22 to 35 seconds to shoot what they needed to capture of Cruise and Wallis floating around in the plane. It's impressive when you hear about it, and this sequence was a big selling point in the marketing, but if you watch the movie without knowing this whole story you might just assume that it was shot with the actors on wires. Also in the 7 and a half minute range is the featurette Meet Ahmanet, which is obviously all about the Mummy herself. While this featurette goes into the fact that we were meant to make an emotional connection to Ahmanet, much like we did to some of the original Universal monsters, that is one area where the film wasn't really successful for me. I did not connect with Ahmanet, I always just saw her as evil and power-hungry. 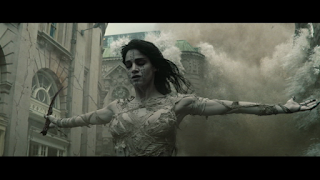 The featurette also goes into the evolution of Ahmanet's look throughout the film, as she starts off rotted and with her body twisted and broken from the plane crash. She gradually regenerates, thanks to the life force of her victims. The twisted body movements of the broken Ahmanet were performed by contortionist Claudia Hughes. The Cruise in Action featurette is 6 minutes long, and is of course about Cruise's dedication to the action scenes and performing his own stunts - an admirable dedication that, unfortunately, recently caused him to be injured on the Mission: Impossible 6 set. 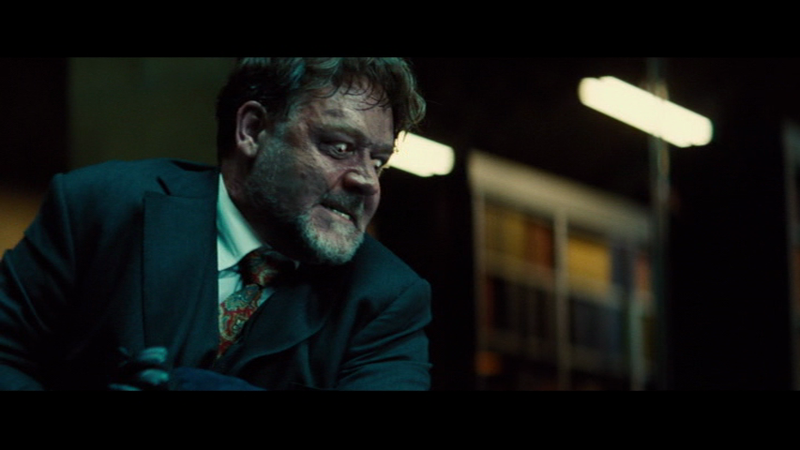 With the 7 minute featurette Becoming Jekyll and Hyde we get to learn how Russell Crowe approached the role of his troubled character. Although The Mummy has nothing to do with the 1886 Robert Louis Stevenson novella that first introduced Jekyll and Hyde to the world, Crowe even went so far as to read the novella while preparing to play the man and his alter ego. As Crowe describes it, he plays Jekyll along the lines of Stephen Fry and when he transforms into Hyde his performance is inspired by Ray Winstone. 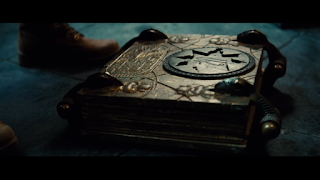 The featurette further examines the character by taking a look at his office, his costume, and the props Crowe had to work with. Cruise and Crowe had been wanting to work with each other for a long time, they've been friends for a couple decades, and I think it's awesome that they finally got their chance on a Mummy film where Crowe plays Jekyll and Hyde. It seems like Crowe had a blast working on this movie. The 6 and a half minute Choreographed Chaos featurette is about the sandstorm sequence in the center of London. Every time I've watched the movie, this sequence has felt out of place and inconsequential. As I said above, it feels like something that was added in as an afterthought. 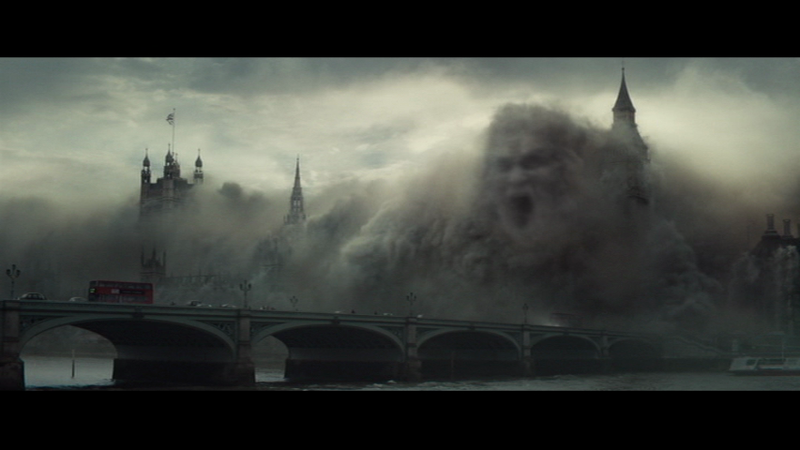 However, in this featurette Kurtzman says the sandstorm in London was actually the first idea he had for the film, as it represents "a monster coming to our world in a real way". So it's interesting that it feels so awkward to me. Maybe it was something they were determined to include whether it fit in or not, and that's why it seems out of place. Just under 6 minutes, the featurette Nick Morton: In Search of a Soul is about an aspect of the film I find interesting and entertaining, the arc of Cruise's character. He's an immoral guy who has to find his soul and humanity while battling this supernatural evil. I find Nick fun to watch, I like this rather unlikeable guy. Finally, we have Ahmanet Reborn: Animated Graphic Novel, which is a 4 minute animated look at Ahmanet's back story that gives her an inner monologue written by Mark Bristol and depicts her evil actions through artwork created by Christopher Shy. Although we get plenty of the back story in the film itself, Shy's art is nice to look at. 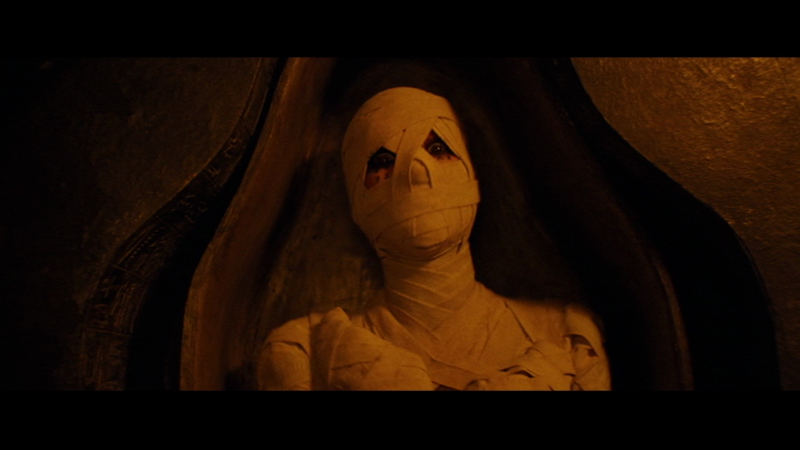 Overall, The Mummy Blu-ray / DVD is an impressive and informative package. I'm really glad the film got this special edition treatment, and going through all of the bonus features actually gave me a deeper appreciation for the film itself. It was interesting to learn the filmmakers' intentions as they were putting the movie together - even if it didn't all work for me in the end, it's clear that they put a lot of thought into every aspect of the film. 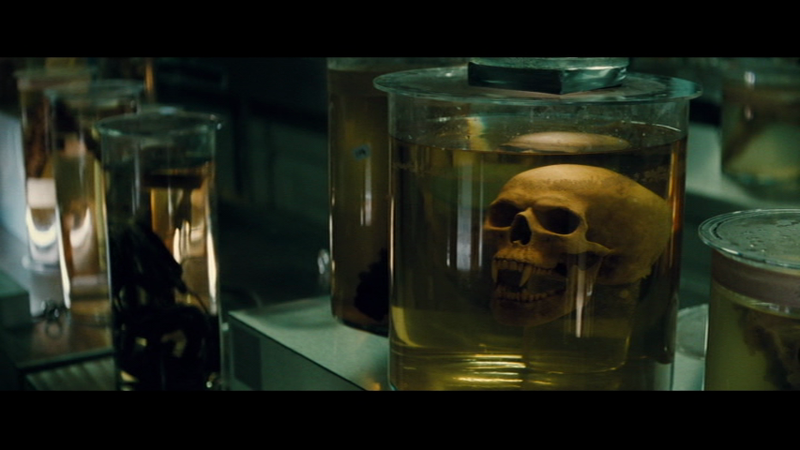 They certainly had their heads in the right place when they were making The Mummy, and it was a commendable effort. The Mummy Blu-ray / DVD will be on store shelves as of September 12th.